M+S is acting within Germany as an independent liner agent for various reputable shipping companies, covering most of the world’s main trade areas by different modes of transport (break-bulk, container, Ro/Ro). 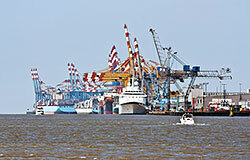 Furthermore we hold the waiver offices within Germany for a number of West African state-owned organizations and are strongly involved in the field of ships clearance/husbandry and project chartering/heavy lift transportation. As founding member of Worldwide Ship Agencies Association (WWSA) we offer shipowners and our principals a network of independent ship agents in over 40 countries. 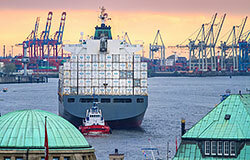 NVOCC and container logistic activities as well as other services connected with inter-modal transportation are performed by our affiliated company CTL Container Transport Logistik GmbH.